2009 Winner Firefighter of the Year! Technical Sergeant Scammahorn has been in the fire service for 14 years. 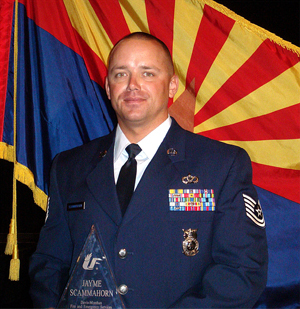 During his career, Technical Sergeant Scammahorn became proficient in firefighting, technical rescue, and hazmat. The knowledge he gains he gladly shares with others, clearly demonstrating this by the life saving emergency first aid techniques he taught to the ROTC and 300 Civil Engineers. Also a gifted fire instructor, Technical Sergeant Scammahorn has provided 45 fire protection classes and participates annually with Fire Prevention Week. Vast knowledge is essential to be a firefighter, but only one of many essential talents required to make up a good Firefighter of the Year. Great character is also important, and Jayme has plenty of that! Jayme directly contributed to war efforts by twice donating platelets to the Red Cross to help wounded soldiers. In addition, he donated selflessly to the Air Force Aid Society that helps the worlds deprived. But what’s most impressive is his willingness to donate his time. Recently this firefighter donated four hours as a “designated driver” to go get and safely transport home two of his very own. Lives and careers were saved! 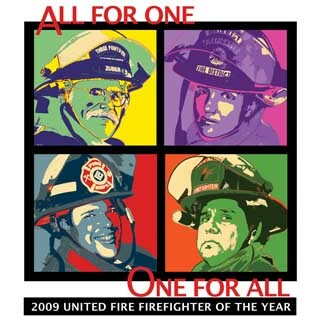 Deep down underneath all the tough exteriors, most firefighters have similar values. It doesn’t matter, if you are paid or volunteer, a rookie or veteran, from a small town or even a large military base, behind the firefighter tough image there must be a caring person. This was one of the many reasons Technical Sergeant Scammahorn was hand-picked for “Operation Southern Partner,” a deployment visiting five countries in the Caribbean with the purpose of exchanging ideas and developing lasting international relations. Strong character often develops into leadership ability. While technically holding a duty title of Captain, this outstanding firefighter has often been placed in the role of Station Chief, dutifully managing the assignments of 29 firefighters and taking command for 100+ aircraft, structural, and EMS emergencies. It was a combination of Technical Sergeant Scammahorn’s firefighter training, experience, and character that allowed the following situation to end with a positive outcome. In 2008 Technical Sergeant Scammahorn was deployed to an Air Force Base in the United Arab Emirates in support of Operation Iraqi Freedom and other operations around the globe. It was July 28th and our hero was sitting in the Captains seat of one Crash Truck while leading a second Crash Truck to get serviced. As they passed through a checkpoint, suddenly shots were fired from an unknown location. Four bullets penetrated the window of the second vehicle and the driver was shot in the eye. Three bullets penetrated the lead trucks siren, exhaust manifold, and roof turret, barely missing heads by about 12 inches. This was an area where gun fire does not normally happen, adding to the shock value of the incident. Amazingly, the driver of the second vehicle somehow got his truck slowed and was able to get down out of harms way. The Firefighter of the Year, quickly assessing the situation directed his vehicle out of the line of fire and used available cover. Then, disregarding the possibility of continuing to be fired upon, proceeded through open area with no weapon, body armor, or cover fire to try and save his wounded brother firefighter. Never losing his composure, confident in his abilities, this firefighter had the situational awareness to still stop and set the break on the unsecured vehicle and then drag his wounded partner behind a short concrete barrier that was out of the line of fire, ensuring that no further injury would occur. He then requested immediate fire and medical response. Persevering through hyperthermia, Jayme led the care for his firefighter brother on the ground, and in the ambulance, and even stayed with the wounded man the entire time he was in the emergency room. Great situational awareness and creative thinking took hold when identifying a safe haven to move his wounded brother. 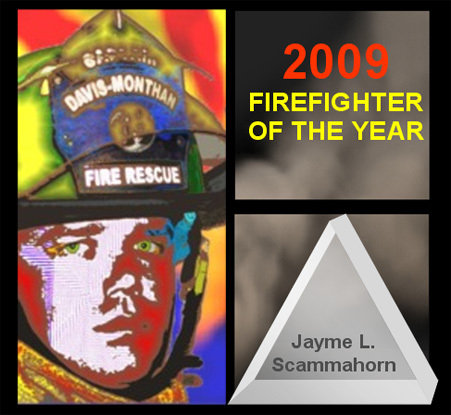 Jayme used his firefighter rescue techniques, first aid, and war-time-skills to their fullest. This allowed his training, service before self and courage, to save the life of a fellow firefighter. This has been a big year for change, not limited to our economy, our President, and now for the first time, an Arizona Firefighter of the Year, from the Air Force. When it comes down to putting the wet stuff on the red stuff, no matter where in the world, no matter what race or religion, goals, strategies, or ideologies, firefighters are really all the same. "ALL FOR ONE and ONE FOR ALL" is not just a motto, it is a way of life.